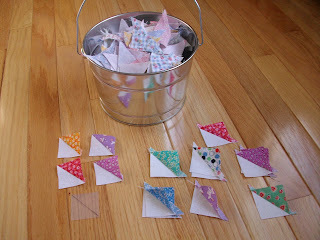 For me a bucket of anything to go is good, but a bucket of half square triangles is even better. 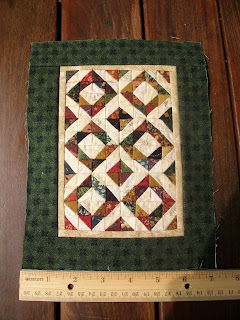 Do you remember a few posts back when I was making the 1930's spool blocks? 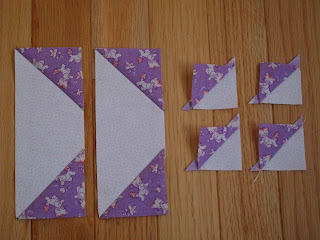 I had mentioned that whenever I am sewing squares on the diagonal, I take the time to sew the extra seam and it gives me all the extra half square triangles (remember the bucket of them in the clamp Tool Time Tuesday). 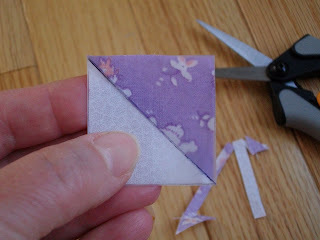 Well, here is a little tutorial on how I square up the little 1.5 inch half square triangles without using a rotary cutter. With this technique, you can square them up while watching tv, out on your porch, in the car or like me today...at the beach. I get antsy at the beach, so I always need something to do!!!! The 2 outer rectangles of the block are white and have 2 squares placed on each end. I drew the black line so you could see the direction of where the stitching will be. 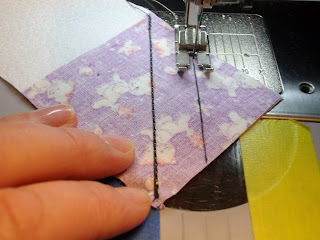 I sewed the first stitching line from corner to corner. 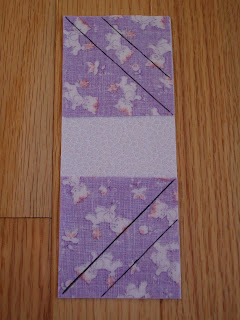 Then I sewed again a 1/2" away from the first stitch line. I use a piece of blue painters tape to mark my machine so it goes faster. Now simply cut between the 2 stitch lines. 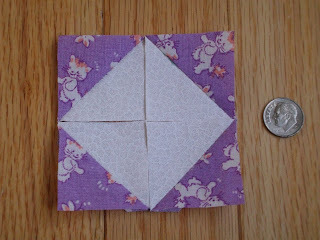 For each of the 2 rectangles that you need for the spool block, you will get 4 little extra half square triangles. The 2 on the left are for the spool and the 4 on the right are your extras, all ironed and waiting to be squared up. Here's my bucket to go!!!! 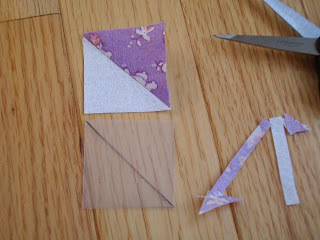 The next few pictures are the tutorial for squaring them up without using a rotary cutter. spaceFirst take the square and measure it. Mine are a little larger than 1.5 inches. 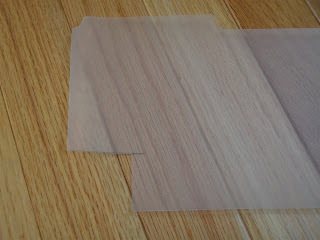 Take a piece of medium weight plastic, somewhat see through. I used a notebook divider. You can also use template material. 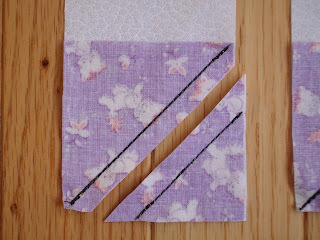 Cut a square to your desired size. Mine will be 1.5 inches. With a permanent thin tipped marker, draw a line from corner to corner. 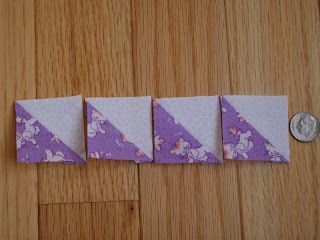 Now place your plastic square on the fabric half square triangle and match the black line to the diagonal line of the seam. 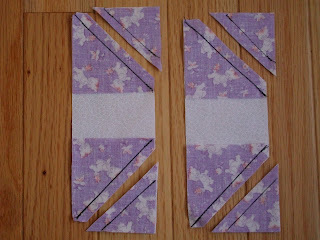 With little sharp scissors, trim the excess fabric and the little pieces that are sticking out. 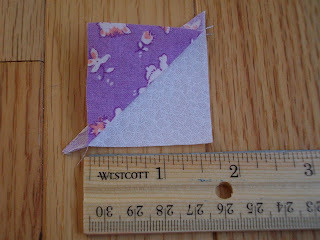 Here you have a finished half square triangle that will finish up in a quilt at 1 inch. Tiny I know, but oh so cute in a mini quilt!! The next few pictures are different arrangements to use them in mini quilts or borders. 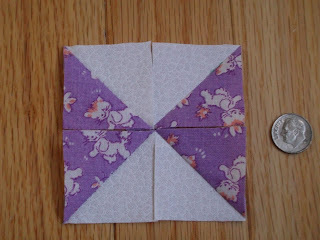 These last 2 pictures are of a little quilt I made using this technique. 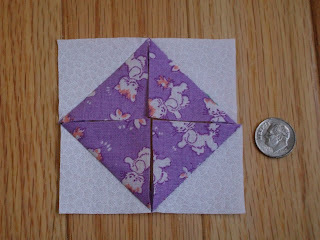 This was made with the extra half square triangle from a Thimbleberries quilt. I trimmed them all to 1 inch and the finished squares are 1/2 inch. 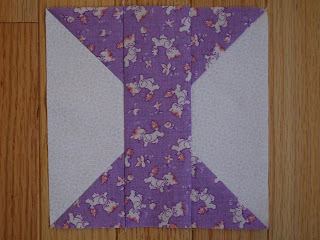 The mini quilt is 7" x 9" with a matching pillow sham. I certainly didn't waste any fabric on that one!!! 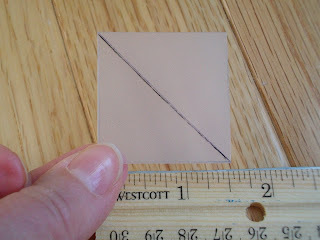 I hope you can use this idea the next time you have to trim your squares. Just imagine yourself in a comfy chair, instead of hunched over your rotary mat with a pile of half square triangles staring at you. I've always felt a bit guilty when I throw the extra triangles away, but I think "I'm never going to get to them!" Now I can just do it at the same time! Have I said it too many times? "You are BRILLIANT!!" Thanks, Karen...the photos are a huge help when something like this is being explained! Oh Karen!! My head is full of hexagons because of you, and now, is going to be full with triangles as well!!! Thanks for this clear tutorial!! 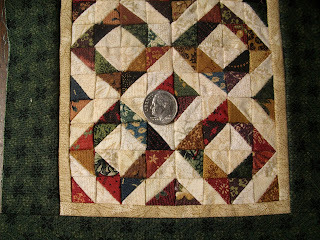 Since I'm so new to quilting I have thrown them out but hated to do so. I save all my scraps but didn't know what to do with those leftovers. Now I know...Thanks! At the beach?? You lucky girl! What a great idea! I have a big bag of bonus squares, but I am slow to trim them because it feels like it takes forever with a big square up ruler and rotary cutter hunched over tiny squares. I will have to try it this way. 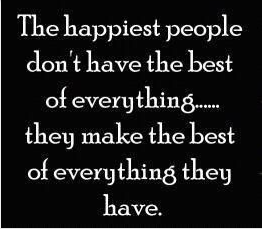 I wish I had known this sooner. I did a wall hanging with left overs, but mine weren't square and it didn't turn our as nice as it should have. I will use your idea next time. Cute, Cute, Cute,!! I have been saving triangles from past projects for years! My bucket runneth over!! Now I know what to do with them. First I have to find my bucket, hmmm. It's around here somewhere, probably hiding under all my fabric! Great way to square up triangles and I love your mini! I can't bear to throw the extra triangles away, but usually just toss them unsewn into a basket. This is a great idea! And I like the idea of being able to square them up while watching TV. Thanks. That is so clever> I have that ruler to guide me. I am going to try that too. Whatcha going to do for tomorrow? Very cute and a great way to make use of those left over corner bits!! Thank you for making this all so clever and wonderful! 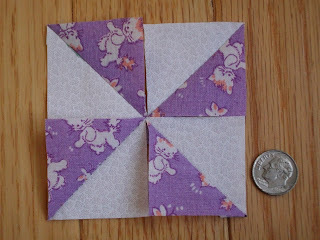 Thank you, Karen, for this fabulous idea for squaring up little blocks! Yes, it's so much more fun to trim in front of the TV with a good romantic comedy playing. Thanks for a great idea! I recently did a quilt where I could have saved all those bits. I will definitely use this in the future. btw, thanks for all your tool time Tuesday posts, too! Ok I don't usually quilt but,this might be something I think I could handle.I have a stash of material too small to do any projects with that I can't bring myself to trow away. Karen....thanks for this wonderful tip! Great, great, great!!!! I love this idea! I always give my extra ones to this lady in my guild. Now I see what fun she has with them! 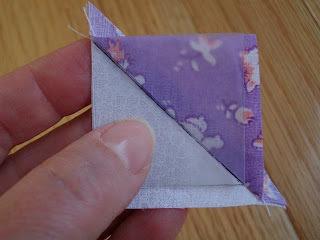 I have quilt idea that I was thinking of using this quilt block and this is such a better way to do it. Thanks!